Interested in buying a product development book, but not sure if it's worth the money? Read the most current book reviews below, or click on the links below to see archived book reviews, searchable by author, book title or reviewer. In 2005, Professor W. Chan Kim and Renée Mauborgne changed the international business landscape. 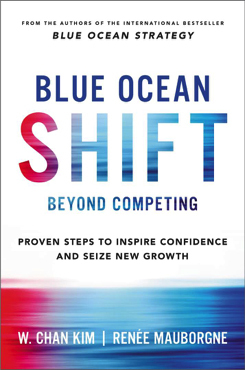 They presented their theory of “Red Oceans” as the allegory for fierce competition in well-established markets, and of “Blue Oceans” which have almost no competition at all. Read more. Written by Silvester Ivanaj and Claire Bozon. Nearly all of us work in virtual teams. We understand that virtual teams (VT) may struggle with communication and collaboration since we don’t see our colleagues face-to-face (F2F). Yet, VTs offer many advantages for new product development (NPD) because they allow us access to diverse perspectives and global market intelligence. Read more. Written by Clayton M. Christensen, Taddy Hall, Karen Dillon, and David S. Duncan. Like many new product development professionals (NPDP), I am a big fan of Clayton Christensen’s work. His latest book, Competing Against Luck, with co-authors Taddy Hall, Karen Dillon and David S. Duncan, does not disappoint. Filled with classic stories of innovation success, the text instructs how to drive business growth from a customer-centric viewpoint. Read more. Who among us does not wish to improve his or her productivity? Charles Duhigg’s well-researched, new book, Smarter, Faster, Better, offers several tips we can apply to our own lives, as well as to our work teams, to improve productivity and efficiency. Read more. Whitney Johnson, a colleague of Clayton Christensen and a frequent contributor to Harvard Business Review, presents an introspective look at disruption in Disrupt Yourself. This small book examines how we can apply innovation theory, like disruption and S-curves, to changing our personal and professional lives. Read more. Product managers and product development practitioners are challenged to satisfy customer needs. Yet without attention to the needs of internal customers and careful regulation of business processes, new products can fail to generate revenue or to meet growth objectives. Read more. Written by Alexander D. Edsel. Breaking Failure by Alexander Edsel examines business failure and underperformance that occurs in many businesses and industries today. The director of the Master of Science in Marketing program for the Naveen Jindal School of Business at The University of Texas at Dallas, Edsel has more than 20 years of product and marketing management experience in the chemical, tech and health care fields. Read more. Written by Linda Hill, Greg Brandeau, Emily Truelove, and Kent Linebeck. Is your organization both willing and able to innovate? If not, or if you’re still getting there, “Collective Genius” will help catalyze your efforts. From the start, “Collective Genius” warns us that the ability to innovate quickly and effectively, again and again, is perhaps the only enduring competitive advantage. Read more. Written by Denise Lee Yohn, “What Great Brands Do: The Seven Brand-Building Principles that Separate the Best from the Rest” identifies seven principles of building a brand that are interdependent on one another, resulting in a holistic approach to building a business as a brand. Read more. Today, customers will change brands and products based on the newest feature sets and rapidly evolving social trends. A company cannot follow a stagnant strategy that fails to adapt to erupting market needs and widespread technological volatility. To survive against clever global competitors, a company must quickly identify and act on new opportunities. Read more. I like to think of myself as smart, funny, not too ugly, and the kind of person who gets things done. But what if I discovered that most of my colleagues find me dull, dim, and just plain ugly? Would it matter to me professionally? As a product manager who relies on people across the organization to get my work done, the answer is a clear yes. This is the kind of problem Heidi Grant Halvorson helps us understand and fix in her book “No One Understands You and What to Do About It”. Read more. Dorian Simpson’s new book, The Savvy Corporate Innovator is targeted to the well-known challenge of gaining funding for a new idea. While start-ups and entrepreneurs follow their passions with inventions, the corporate environment is far more structured and focused on operational stability. The Savvy Corporate Innovator offers tips and tools for a technical expert to move his/her idea from conception through initial funding. Read more. Working in new product development (NPD), we are faced with decisions and trade-offs on a daily basis. Moreover, we are challenged to ensure that product features, target markets, and technologies align with overall business and strategic objectives. Projects are advanced based not only on technical merits but also sales, revenue, and profit forecasts. Read more. PDMA is interested in high-caliber product development book reviews. We welcome submissions up to 1,000 words (including a short biography of the reviewer to include with the submission). If you have questions about writing a book review or have a submission for consideration, please email Teresa Jurgens-Kowal, PhD, PDMA’s book review editor. Are you NPDP certified and searching for a way to earn additional PDHs for recertification? Earn PDHs toward NPDP recertification by writing a book review!